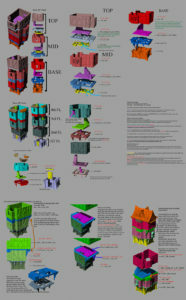 These are some instructions for our 3d printable modular building expansion for Open Peg. Specifically, it deals with a timber frame shell style and an undercut stone foundation. We have also introduced a stair system. Our Primary future needs will include a modular foundation and a ton of roof expansions. Those will be a few months out. This is part of our expanded kickstarter rewards program for our current CITADEL Kickstarter. Our intro Open Peg video can be found at the bottom for those of you that are new. Below find our intro diagram, re-posted one-sheets, and video instruction. Diagrams for the basic set can be found here.